I’m really looking forward to this evening. Expect a lot of insight and many laughs. 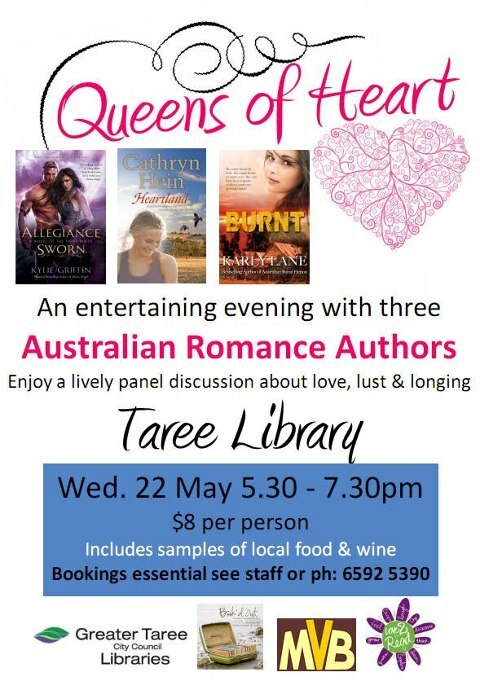 Kylie Griffin (author of the amazing Light Blade fantasy romance series) and Karly Lane (Bridies Choice, Morgan’s Law, Burnt and other awesome Australian-set stories) are lovely people as well as being fantastic authors, and I think we’ll have a fine time. So will you! I’m Cooking the Books with Australian romance author Louise Reynolds. Come on over for a slice of delicious date and walnut loaf, a snippet from Heartland and more! Heartland has scored another wonderful review, this time from Lauren Murphy at The Australian Bookshelf. Tomorrow I’ll be here again with Friday Feast, revealing some secrets from my week with Hugh (ahh, I see your mind boggling already). I’ll also be over on Alissa Callen’s blog answering 10 Teaser Questions. And in case you missed my non-stop squeaking elsewhere, yesterday I discovered that my rural romance Heart of the Valley hit number one on Google Play’s paid ebook store. And it’s still there this morning. Good thing no one was here to video me doing the muppet-flail when I saw that. Could’ve have been rather embarrassing! This entry was posted in Heart of the Valley, Heartland, News and tagged Alissa Callen, Book'd Out, Cooking the Books, ebooks, Google Play, Heart of the Valley, Heartland, Karly Lane, Kylie Griffin, Lauren Murphy, Louise Reynolds, Taree Library, The Australian Bookshelf on May 2, 2013 by cathrynhein.